ATC launches SCM19AT active tower speaker system | What Hi-Fi? The Active version of the company’s Award-winning SCM19 uses a driver/amp pairing in a slender floorstander. It’s no secret that we are big fans of ATC’s passive SCM19 standmount speakers - so much so that we voted them Best standmounter £1200+ in our 2015 Awards. Praise indeed. Now the range is being expanded with the SCM19 active tower, housed within a metre-high and 37cm-wide cabinet. 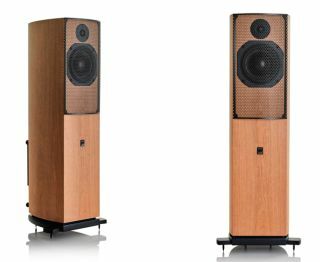 Said to be “acoustically identical” to the passive, two-way model, the floorstander has a 19 litre volume inside the slim tower. It’s fitted with the firm’s SH25-76 soft-dome tweeter and a 15cm super-linear mid/bass driver. The drive units are individually powered by an upgraded biamp pack, using ATC’s discrete MOSFET Class A/B modules, delivering a claimed 32W of continuous power to the high-frequency section and 150W to the bass. ATC says the amps have been revised to reduce noise and distortion, while achieving a lower operating temperature for improved reliability. The braced, sealed and curved multi-layer laminated cabinet is finished in cherry or black ash real-wood veneer. The ATC SCM19AT will be available this month for £4990 a pair.